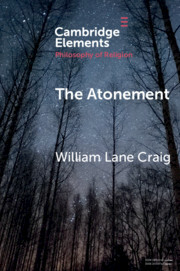 In June 2018, Cambridge University Press released The Atonement by William Lane Craig, as part of its new "Elements in the Philosophy of Religion" series. William Lane Craig is Research Professor of Philosophy at the Talbot School of Theology, a former President of the Evangelical Philosophical Society, and founder of ReasonableFaith.org. The Atonement offers in a concise compass an inter-disciplinary approach to the complex doctrine of the atonement, drawing upon biblical studies, church history, and analytic philosophy. Divided into three parts, the book first treats the biblical basis of the doctrine of the atonement, an aspect of the doctrine not often taken with sufficient seriousness by contemporary Christian philosophers writing on the subject. The second part highlights some of the principal alternative theories of the atonement offered in the pre-modern era, with a view to accurately expositing these often misunderstood theories. Finally part three, drawing upon insights from the philosophy of law, defends a multi-faceted atonement theory which features penal substitution as a central element. By employing distinctions found in legal thought often overlooked in philosophical treatments of atonement, the author seeks to offer a philosophically coherent account of Christ's atonement that connects closely with the biblical doctrine of forensic justification. Enjoy a free sample of the book provided by Cambridge University Press.